A month had passed since Climbing Italy’s highest peak Gran Paradiso and I was getting bored with local cragging and wanted to do something BIG, Looking up I could see the biggest mountain in western Europe, Mont Blanc and though I should give it a go. After speaking to a few friends who are experienced climbers and getting the general idea that the Gouter route was a straight forward scramble followed by a long snow walk I wanted to go it alone. Having a few days off work and a great weather window I headed to Les Houches’ Bellvue cable car at 8am to start the climb. Getting the first lift up I started the long walk to the Gouter ridge scramble which goes past the Tete Rouse hut. 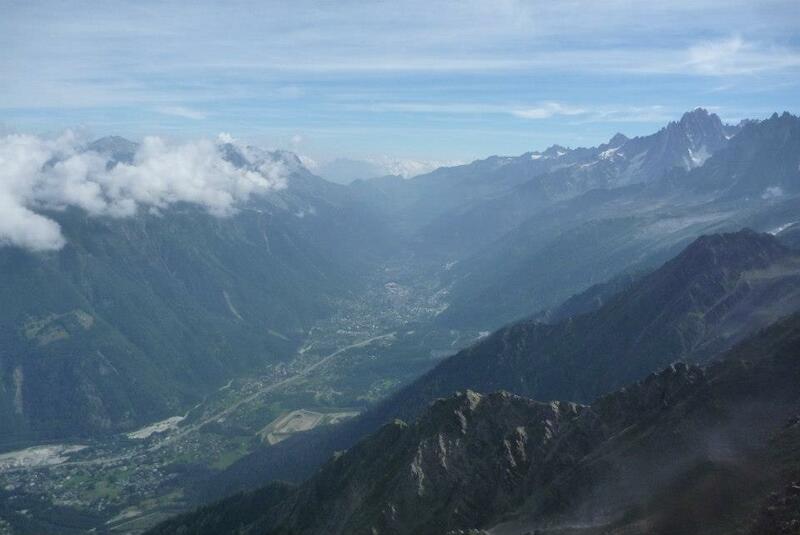 Chamonix looks very small from up here. Crossing the Grand Couloir on the ridge can be quite dangerous as there is often a lot of rock fall, I didn’t see any but I must have been lucky. 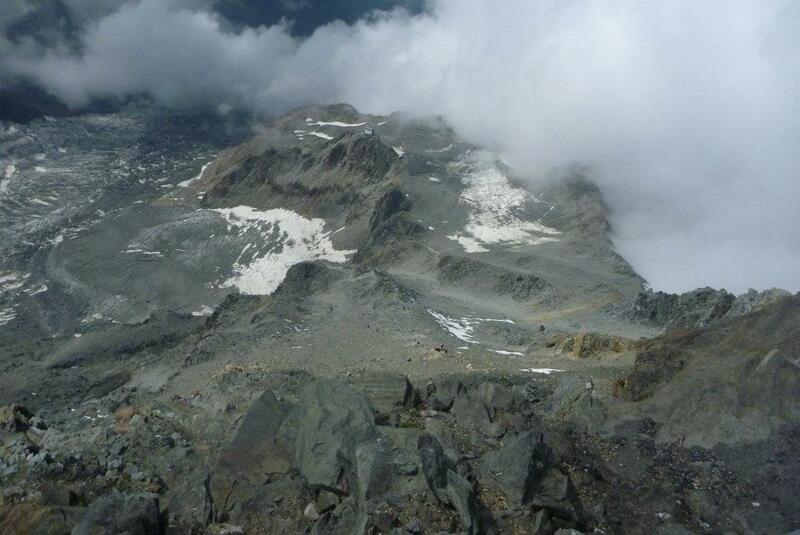 I was straight across and carried on up the scramble to the refuge on the ridge. Looking back down the ridge makes you feel very high and exposed. There are some wires in place to hold on to but it is an easy scramble and good fun. At the top of the ridge you get to the snow line and the Gouter hut, I didn’t stay in the hut but bivied near it on the ridge, It is quite expensive to stay so I decided to just have food there so I could climb a little lighter. Food was still not cheap with 1l of water costing €5 and soup €7. It was however very filling and gave me the strength to make the summit! I slept to the left of the new refuge with the other cheap skates in this shallow grave that someone who climbed a day before had left me! It was cloudy in the evening and I thought I would have to head back down when I woke, but instead I woke up to the clearest sky I had ever seen and committed to bagging the summit. Leaving the bivi at 1am with the hopes of being the first on the summit, I made good progress towards the Vallot hut at 4,350m and reached it at about 3:30am. Chamonix twinkling away miles below just before I reached the Vallot hut. 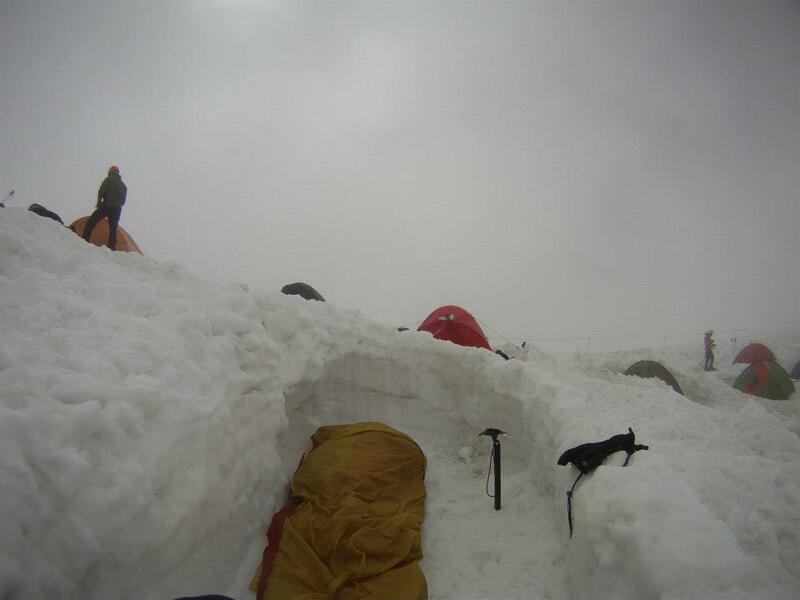 I climbed into it and slept for an hour because at this rate I would be on the summit way too early at about 4:30am! Leaving the hut again at 4:30am I carried on towards the summit. Not seeing anyone ahead was pleasing but also daunting knowing that if I slipped off the Bosses Ridge no one would see me go! I could just make out head torches below me heading up the Dome du Gouter and by now some leaving from near the Cosmiques refuge. I had made it! 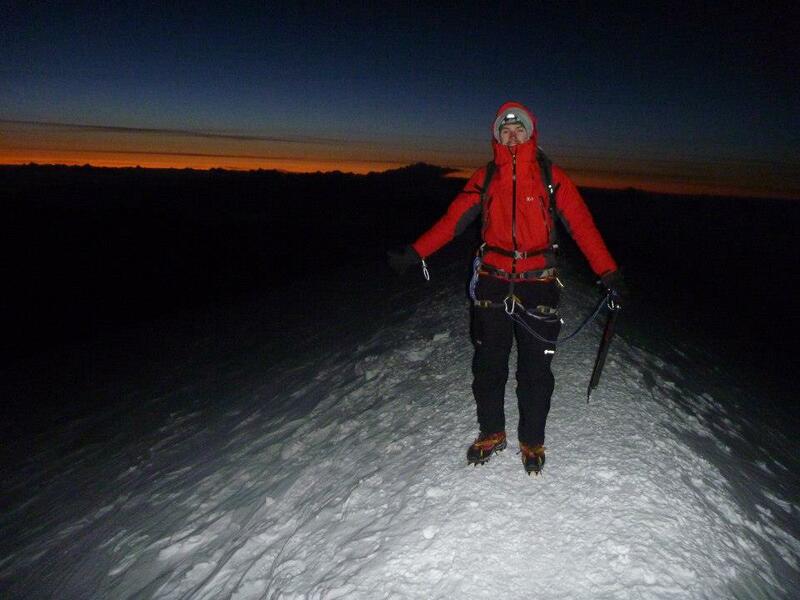 Summit at 5:30am after some very slow climbing towards the top. It was freezing and very windy! I had my spare pair of socks over my gloves and didn’t want to take them off. I waited until I saw the first person on top with me and asked him to take a photo as I didn’t have the strength to work self timer, this was a good 15 minutes after I got there! The sun was coming up over the Alps but the flash still came on! There was something very special about being on the roof of Europe alone at sunrise, It was by far the single biggest achievement of my life, way above my degree! The excitement was short lived as I knew what came next… The descent! Coming back down from the summit early has its downsides, you meet all the people climbing up! I had to step off the main track countless amounts of times and some of the places I did it was not very safe, especially when you are not roped to anyone. 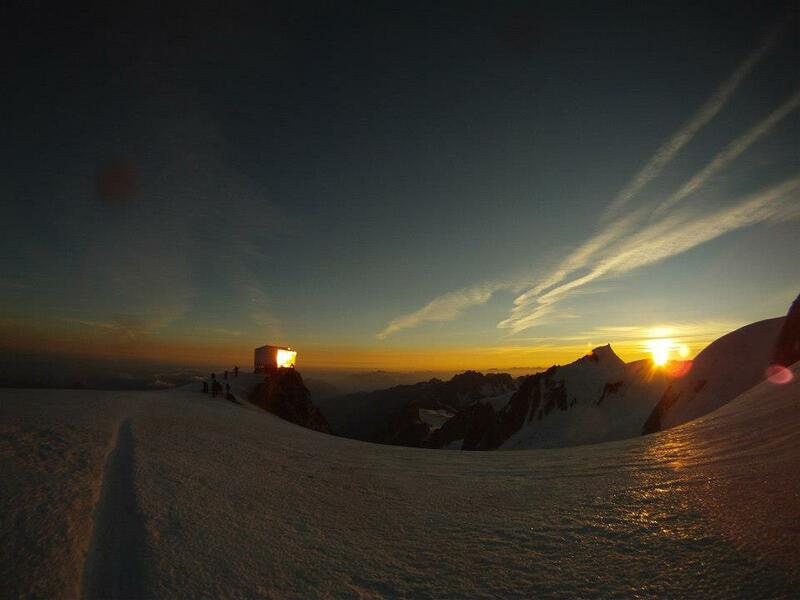 Just above the Vallot hut on my return I snapped this pic of sunrise. 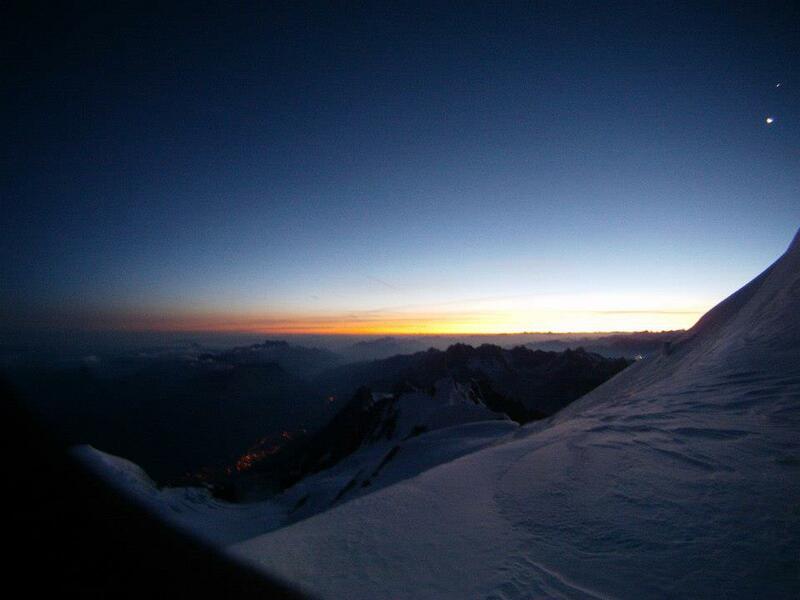 it really captures Alpine climbing and early mornings up high! This warming sunshine kept me going back down to the Gouter to pack up my bivi and head back down to town. The rock scramble down was fine but when I started walking the trails my feet really started to hurt and by the time I reached the Nid D’aiguille I was walking bare foot and swearing alot! 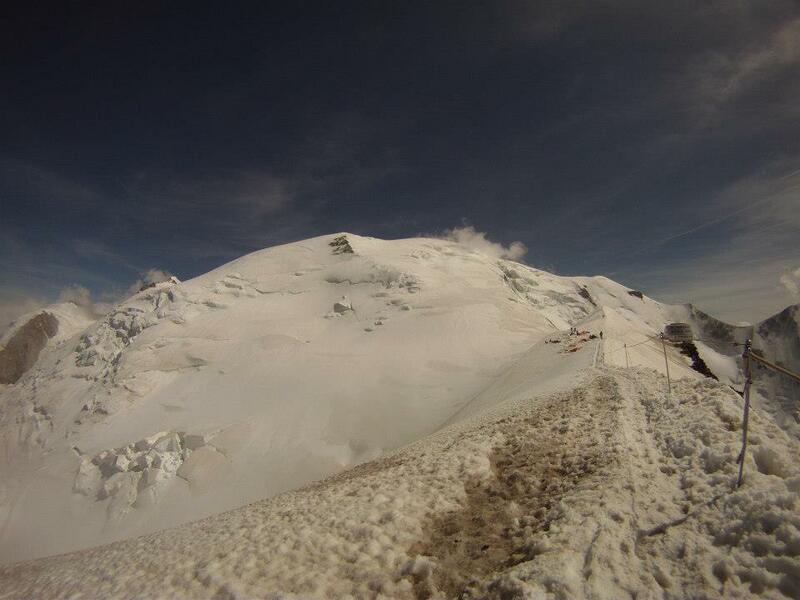 Finally made it back to the lift and was down to town by midday, Very exhausted, craving a beer and overwhelmed with satisfaction that I had climbed Mont Blanc, and climbed it alone!